Solar panels are a valuable investment, so when something goes wrong – you need fast and reliable support. Whilst you see your solar panels as a beneficial power source, many pigeons see them as the perfect nesting place, and that can cause serious problems! 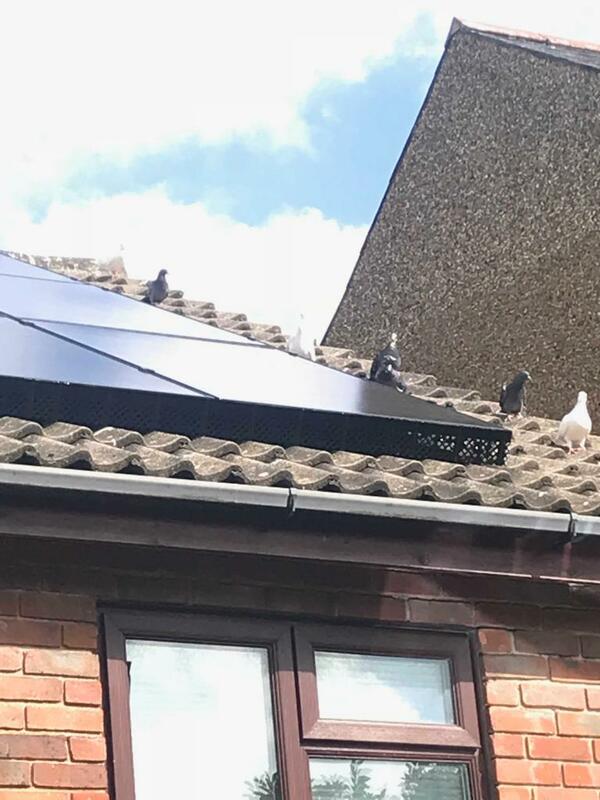 Pigeons are programmed to sit on roofs, and the increasing popularity of solar panels has meant an equally popular hideout for these feathery vermin – they are kept warm and sheltered from all weathers, all whilst damaging your investment! Once a pigeon collective has its heart set on your solar panels, the side effects are irritating and costly. Pigeons nesting in your solar panels can mean scratching sounds, incessant noise and sleepless nights – but Pigeon Proofing Solar Panels quickly and effectively deal with your problem: leaving you pigeon free and flying high! Even the early signs of pigeon presence can be a real pain for your panels: dirt and faeces left behind by unwanted pigeons quickly covers the surface of your solar panels, meaning a decrease in power and effectiveness. In addition to this, bird droppings have a highly acidic quality, meaning that – if left- they can cause corrosion and structural damage. Furthermore, bird droppings are known to be carriers of at least three diseases: Cryptococcsis, Histoplasmosis and Psittacosis – not something you want on the roof above your family home. Luckily Bird Proofing Solar Panels have a rehearsed and failsafe programme to rid you of your unwanted roof roosters. Our representatives will remove these pests and make sure that they no longer have access to your solar panels, ensuring that they will continue to work effectively with no interruptions. Our process is quick and efficient, with an all-inclusive package that means no extra charge for gutter and solar panel cleaning once your pigeon problem has been solved. First: We remove any existing bird droppings from your roof, carefully emptying your guttering and hygienically removing faeces and existing bird mess – ensuring a thorough clean that disinfects the roof without damaging your solar panels. Next: We remove any dead birds, nests and other pigeon debris from beneath your solar panels, ensuring that all remnants and evidence of the birds is completely gone and preventing any further occurrences. Then: Using our secure materials, we measure and fit galvanised metal mesh to each individual outer panel to ensure that pigeons and other vermin can no longer gain access. Finally: We ensure that the entire roof, guttering and solar panels are cleaned – using pure water to cleanse solar panels to maximise efficiency and prevent damage. Once the solar panels have been pigeon proofed and cleaned, it is likely that you will notice an increase in solar power – as existing dirt and mess have been removed and irritating nesting has been eradicated. Furthermore, Pigeon Proofing Solar Panels means that the problem is prevented from reoccurring – ensuring peace of mind for your family home.